Lt Col George E Brink was given the responsibility for establishing the battalion at Roberts Heights and was the first commanding officer. He was succeeded by Lt Col WH Evered Poole. In 1934 detachments were also established for 100 trainees at Durban and 150 at Cape Town. Training included elementary military subjects and physical training. After a year of the young men usually found employment in government departments or with civilian employers. By 1936 the output of the SSB totalled about 2000 youths a year. In 1937 the South African Railways established at Roberts Heights a special school to prepare boys for the railways. In 1937 3788 youths passed through the ranks of the SSB. A total of 882 of them joined the Permanent Force. With the expansion of the South African Air Force in 1937 the SSB provided 248 air apprentices for special training but, with the improvement in the economic situation, the waiting list to join the battalion had dwindled to almost nil. On 15 September 1939, the Special Service Battalion was expanded at Robert’s Heights in Transvaal to form the 1st Special Service Brigade with the 1st, 2nd and 3rd Special Service Battalions. The 3rd Battalion was organized as a junior unit while the first two battalions were adult units. The 3rd Battalion was not completely formed until after Christmas 1939 and was never brought up to full strength. In addition, the 2nd Special Service Brigade was also raised at Robert’s Heights on 1 September from the Class ‘A’ Reservists of the Special Service Battalion and was organized into 4th and 5th Special Service Battalions. A 1st Special Service Reserve Battalion was also formed in 1939, but it was converted to 1st (Transvaal) Battalion of the First Reserve Brigade on 29 February 1940. The Pioneer Battalion had been formed in 1934 from men in the age range 18-30, who were not educationally qualified for the Special Service Battalion. This unit was authorized on 15 September 1939 to recruit up to strength of 3000, but by the end of the year it was absorbed into the Special Service Battalion. Later in 1941, the Pioneer Battalion became a component of the Youth Training Brigade. Both 1st and 2nd Special Service Brigades were short-lived. The 1st Special Service Brigade was to be organised as an Active Citizen Force Brigade on 1 June 1940 on a war basis and the personnel were asked to take the Extended Service Oath (or Africa Oath). Since only one-third were willing to take the oath, the brigade was broken up and the Special Service Battalion was once again organized as a standard volunteer battalion for home service at the end of June. Many of the men were drafted to the Field Force Battalions on 1 February 1940. The 2nd Special Service Brigade was converted to the Field Force Brigade at Ladysmith on 1 February 1940 and 4th and 5th Battalions were reformed as 1st, 2nd and 3rd Field Force Battalions. Even though the 3rd Battalion was slated to be part of the brigade, there were not enough volunteers to form three battalions so it was dropped on 29 March 1940. This brigade was renamed 2nd South African Infantry Brigade on 13 May 1940 and mobilized for service under 1st South African Infantry Division on 22 May 1940 at Premier Mine. 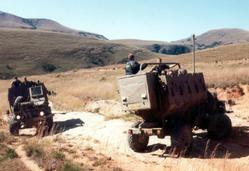 The Mobile Field Force was 15 September 1939 to command any South African Divisions raised. Planned at this point were two Active Citizen Force Divisions and GHQ Troops of two mounted and two dismounted brigades. First of the formations raised under the Mobile Field Force were 1st and 2nd Mounted Brigades. These were raised in November 1939 at Ladysmith and consisted of 1st to 6th Mounted Regiments along with 1st Field Squadron, SAEC. 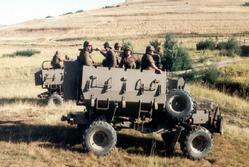 The brigades were formed into 1st Mounted Commando Division at Piet Retief on 10 June 1940 and mobilized in July 1940. The formation was short-lived and was disbanded on 1 February 1941 and reformed as 1st, 2nd and 3rd Mounted Commandos. 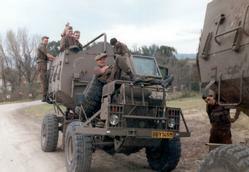 These Mounted Commandos were later absorbed into the South African Tank Corps. The men who remained in the Defence Rifles Associations (DRAs) at the start of war were formed into Commandos of a minimum of 600 members. Many men joined the Mounted Brigades listed above. On 30 June 1936 there were 1382 different DRAs or Commandos in South Africa. This informal part-time organization was later formed into home-service divisions during the war. Many were called up to join the Active Citizen Force on 19 March 1940. 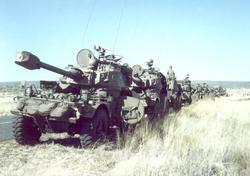 These units along with the associated artillery and engineers would form the bulk of the Mobile Field Force. In March 1940, these 36 battalions were tentatively organised into twelve brigades. Since both 1st and 2nd Field Force Battalions, formed from the Special Service Battalion, and the newly formed 1st and 2nd South African Police were included in this structure, it left four extra battalions not assigned to any brigade. Because of difficulties in recruiting and the Africa Oath, some units did not mobilized or were absorbed by others. 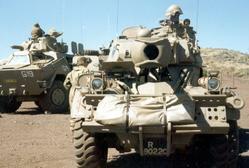 Some units transferred to the newly formed South African Tank Corps as well. There were many changes in the organization of the brigades by the time they were mobilized in May-July 1940. In February 1940 a number of troops were transferred to the 1st and 2nd Field Force Battalions. These served with distinction in East Africa, Abyssinia and the Middle East as part of 1st South African Division. In August 1941 all members of the SSB below the age of 18 were transferred to the Youth Training Brigade. 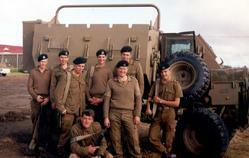 The remainder formed an infantry battalion, which was converted to an armoured car commando in 1942. 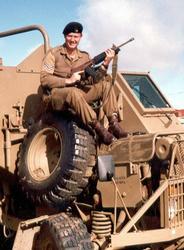 In February 1943 the SSB, under Lt Col EG ('Papa') Brits, became part of the 11th SA Armoured Brigade. In March 1943 the Field Force Battalion was disbanded and other ranks and some of the officers were transferred to the SSB, thus providing a nucleus of battle-tested veterans. The unit sailed for the Middle East with the 6th SA Armoured Division in April 1943. In 1944 the division crossed the Mediterranean Sea to take part in the Italian campaign. The regiment played a prominent part in numerous actions during the campaign. In September 1946, SSB was resuscitated as a Permanent Force unit and reorganized on a two-battalion basis with the 1st Battalion as an armoured unit and the 2nd Battalion infantry. 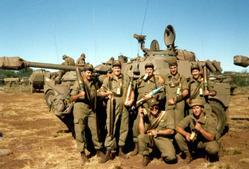 The former became a training regiment in 1953 and the latter was renamed the 1 SA Infantry Battalion (1SAI) in 1951.